The 2017 annual members show will be the first exhibition mounted at our new location at The Beacon, 9 West Hastings Street. 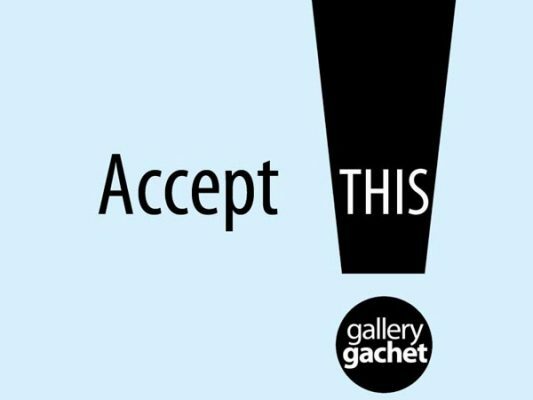 Accept This! – Is our spirited invitation to come and see us in a new light. The exhibition features personal and political expressions of acceptance from 14 artists engaged in the struggle to keep creativity alive in their lives and communities. The tranquility suggested by the practice of acceptance is rendered starkly against its close but less serene cousin resignation. Artists: Sharon Burns, Stella Castell, d. June Conley, Edzy Edzed, Lara Fitzgerald, Karen Irving, Pierre Leichner, Mary O’Toole, Heather Pelles, Tchavdar Petkov, Bill Pope, Bruce Ray, Rebecca Slattery, Zola.Curated by Carmen Ostrander. The idea of acceptance in spirituality, therapy and recovery promises a kind serenity, if you can master ‘letting go’. But for those of us actively engaged in resistance, in hanging on and hanging in, there is another kind of acceptance at work, the kind that doesn’t let go. The kind that welcomes you in and holds you close. The works featured in this exhibition straddle a precarious time in the gallery’s history where the future loomed uncertain and survival meant change and upheaval. The collective expression of this transition encompasses a spectrum of tension and harmony, centered around a revitalized understanding of our role in this community, our basis of unity and continued commitment to culture building as a human right.